Three years ago I used to sit on a bench on the river bank directly across from Washington Sailing Marina, looking at the boats sail by, thinking, “That must be nice. I wish I had the connections and money to join (what looked like) a private sailing club.” I lived vicariously through this scene, and it made me happy, for a while. Then one day a friend inspired me to go over to the marina and take a closer look. Much to my huge surprise, I saw notices on the bulletin board for several sailing clubs, and they were all public. The next day I created my Sailing Club of Washington (SCOW) profile and mailed in my membership agreement. The following Thursday I went to my first Thursday Social Sail. The skipper I sailed with that evening was full of information, patient, and happy to teach and to answer all my questions. I was eager to learn and willing to do anything. As I went again and again to Social Sail, I met many more skippers who helped me learn. I kept abreast of the club’s activities and volunteered as often as I could. My favorite volunteer activity, still to this day, is participating in the Special Olympics racing program. Volunteering with SCOW led to deeper relationships and more opportunities, invitations to crew with SCOW, and other sailing clubs and associations, and more requests to volunteer for events. I was invited as a permanent race crewmember on a Pearson 37 (with them I’ve twice raced in the Governor’s Cup distance race), and I joined the Race Committee. Joining the Race Committee led to two wonderful opportunities: getting certified through the U.S. Coast Guard’s all-encompassing sailing and safety course and qualifying as a Principal Race Officer (PRO) through the official Race Committee class offered by U.S. Sailing. 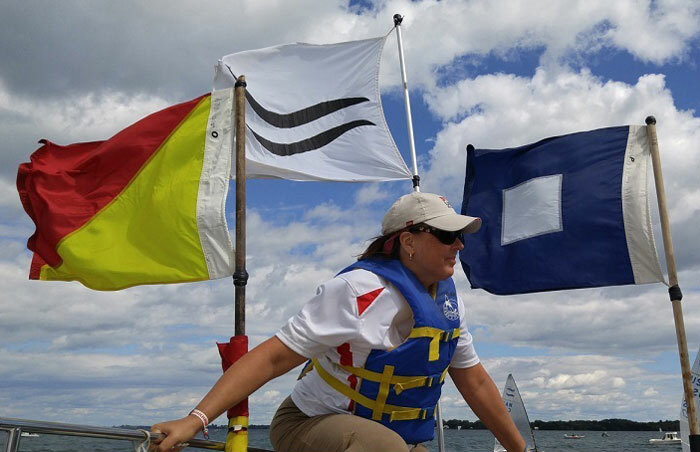 That led to the most exciting sailing volunteer job I’ve ever had: In July 2017, I was asked to join the Race Committee team for a week-long international, official Olympic-level competition on Lake Ontario, Canada. The racing requirements and processes were basically the same, but this time the expectations of the competitors, their coaches, and their judges were higher. The PRO judged each of us on our duties, and we were evaluated at the end of each day. One day, I was on the pin boat, lifting and dropping marks. The other days I was the signaler, responsible for raising, securing, and lowering flags for three classes, as well as the prep and four alternative penalty flags, two other warning flags at the start, and two recall flags, in addition to identifying and displaying the course type and direction for each class. It was a week very well lived, through varying and distinctive challenges that have had a profound impact upon me, which now reverberates through everything else I do. And it’s only been three and a half sailing seasons so far! I think I am making up for lost time, and I look forward to all the other surprises, opportunities, and friendships that are undoubtedly on the horizon in the coming seasons. I am very grateful to SCOW skippers and all the other SCOW members who made every moment of this possible.